In this study we examine if the spot and forward interest rates of the Canadian Treasury bill market are cointegrated and test the bill market efficiency. The data used are monthly average yields of three- and six-month Treasury bills from July 1962 to February 1996. Both spot and forward rates are found to be I(0) and cointegrated in the Engle-Granger (1987) sense. Tests based on Hansen=s (1982) GMM method support the bill market efficiency hypothesis. Park, Soo-Bin. (1997). 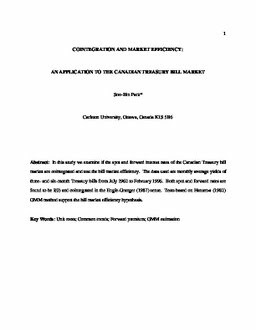 Cointegration and Market Efficiency: An Application to the Canadian Treasury Bill Market (No. CEP 97-06). Carleton Economic Papers (CEP). Department of Economics.